In Pakistan, it is rare of rarest happenings when a spy chief in the office or out of office is publicly summoned to GHQ the headquarters of Pakistan Army, Rawalpindi to explain his conduct. A host of army generals in the country created by Jinnah ‘through his indomitable will’ from General Mohammad Asghar Khan, ‘Generals in Pakistan Politics (1958- 1982) to General K.M. Arif, ‘Estranged Neighbours – India and Pakistan 1947-2010’, have penned down their memoirs and published books. Nevertheless, there is no instance (at least to my knowledge) when any of the military officers have been summoned openly to the GHQ for writing a book. Some Pakistan newspaper saw the announcement made by the army as a response to the statement made by Nawaz Sharif. It seems the contents of the book are going to echo in the streets of Pakistan during the coming elections.It will be too early to say, if it rolls down into a big controversy and gathers momentum like a snow avalanche helps the Nawaz Sharif to further “army victim discourse.” Nonetheless, in the coming months, it is bound to be a political discourse in the beleaguered country- unless army takes corrective measures. The paperback book spreading over 255 pages interestingly starts with a quote from poet ambassador of the resistance movement Agha Shahid Ali: ‘If only somehow you could have been mine,/what would not have been possible in the world? The Introduction to book by A.S. Dulat also starts with a quote from another Kashmiri Saadat Hassan Manto. “Pointing to the horizon where the sea and sky are joined, he says, ‘It is only an illusion because they can’t really meet, but isn’t it beautiful, this union which isn’t really there.” The book has seven sections, thirty-three chapters, an introduction,and preface. 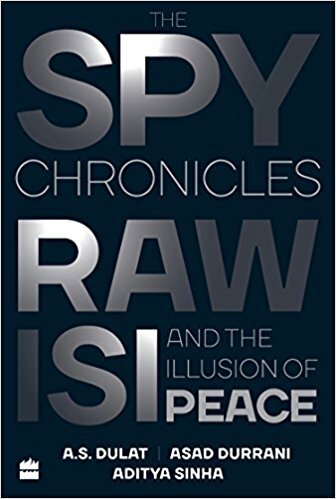 The book is first of its kind in the sub-continent in as much it has been for the first time when former spy heads of the two hostile countries engaged in plotting conspiracies and undermining each other’s interests sit around a table for freewheeling discussions about the policies of their countries. That too with a journalist/writer to be recorded and published in a book- thus preserving it for the posterity. This column is not a review of the book- the book has lots of material to be discussed and lots of ‘dominant discourses’ in sugary language that could be debunked even by any student of contemporaryKashmir history. Nevertheless, the column is an overview of the book to understand its import in a limited sense. In his preface to the book Aditya Sinha rightly observes, “Spychiefs rarely talk to each other—you can be certain that the spies never do— though there have been occasions whentheir governments havedirected them to do so. In the last two decades, some formerspychiefs have come together to exchange views in Track-II dialogues. But they have never spoken openly.” It may be a big question for Pakistan establishment, why the former ISI Chief chose to put on record certain controversial issues that could be the causeforembarrassment for quite some for his country. As an insider, in this book he has discussed with his once counterpart nowa friend and co-author on a wide range of subject concerning the two hostile nations. He has brought on record someissues which perhaps otherwise would have been classified for his country- never to be declassified. Some of the issues that continue to be debated or evencan alterPakistan’s state discourse include the birth of the Hurriyat Conference, Kargil Operation, Hafiz Saeed, Abbottabad Operation against Osama bin Laden, the arrest of Kulbhushan Jadhav in Pakistan, Kashmir Struggle and Burhan Wani phenomenon. The story about the birth of the Hurriyat that has generated a debate on the social media raises some fundamental questions if an “armed rebellion” at all needs a political forum to direct its course-there is no such instance in the history. The classic examples could be Algeria, where it was the FLN, that led the armed struggle and engaged with Paris that ultimately engaged in dialogue with France culminating in the independence of the country.He says, “ The biggest failure was when the Kashmir uprising happened we did not know how far it would go. These things usually run their course in six months or a year. When it became lasting, we wondered how to keep a handle on it. We didn’t want it to go out of control, which would lead to a war that neither side wanted. Could we micro-manage it? That was our challenge. ISI’s leverage on the Kashmir insurgency turned out less than successful……I think the formation of the Hurriyat to provide a political direction to the resistance was a good idea. Giving up handle on the movement—letting the factions do what they bloody well wanted to—was not.” If the formation of the formation of multi-party combine for giving direction to armed rebellion, it was an ill-conceived idea. Nevertheless, there were other discourses about the birth of the Hurriyat Conference in public domain. One of them that the idea was born in a farmhouse, in Manadi Delhi. The government of India had brought top leaders Syed Ali Shah Geelani, Abdul Gani Bhat, Abdul Gani Lone and Molvi Abbas from different jails and put them under one roof in the farmhouse, for enabling them to have a free discussion amongst themselves. Those days, New Delhi’s only major concern was ending the armed struggle and lots of intellectuals visiting the state had suggested for creating a political discourse in the state as an antidote to militancy. The assertion made by Assad Durrani about the birth of Hurriyat call upon the Hurriyat leadership to respond.